The parasite blood test checks for parasites like malaria in the blood. What is the parasite blood test? The parasite blood test checks for parasites like Babesia and malaria in the blood. Why is this parasite blood test important? The parasite blood test is important for identifying malaria and other treatable parasitic infections. This Parasite Blood Test is a blood test. The parasite blood test, also known as a malaria test, malaria blood test and parasite lab test, checks for parasites and malaira in the blood. Parasites are common throughout out the world and parasite blood infections can occur through transmission from vectors such as mosquitoes and ticks. A parasite blood infection can cause symptoms ranging from mild illness and fevers to more advanced signs of organ damage. In contrast to the ova and parasite stool test which identifies parasites in the gastrointestinal tract, the parasite blood test, as the name suggests, checks for parasites in the blood. Malaria is a disease caused by parasites of the Plasmodium type. Malaria exposure typically occurs after transmission by an infected Anopheles mosquito. Symptoms begin approximately one week after an exposure and include flu-like symptoms which can progress to more advanced liver and neurological issues. Because malaria can cause a wide range of symptoms, it is often underdiagnosed. While less common in the United States, malaria blood infections are more common in other parts of the world. Babesia is another parasite tested for in this blood test. Babesia is a parasite typically transmitted through the saliva of infected ticks (e.g. deer). Babesia infects the red blood cells of humans and, often, the symptoms are mild. Sometimes, however, babesiosis can progress to more severe issues such as red blood cell destruction and liver problems. To get a parasite blood test near you, order online and get blood drawn at the Quest Diagnostics lab selected when ordering. 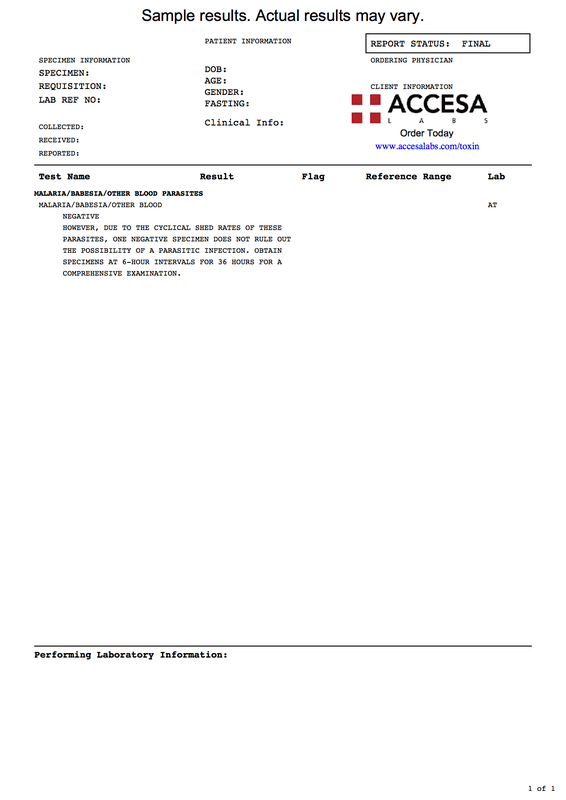 Once the blood parasite lab results are ready, they will be available for download. As can be seen on the sample parasite lab report, the lab will report negative if no parasites are found after analyzing the blood. This parasite lab test includes for malaria and babesia. This particular blood test is not recommended for the detection of microfilaria. Additionally, one negative parasite result cannot completely rule out the absence of a blood parasite and repeat testing should be considered, depending on the clinical context, in consultation with your licensed medical provider. The parasite blood test is part of the more comprehensive infection panel test. For general toxin screening, the toxin panel test is a better option. Parasite Blood Test at Guaranteed Prices.